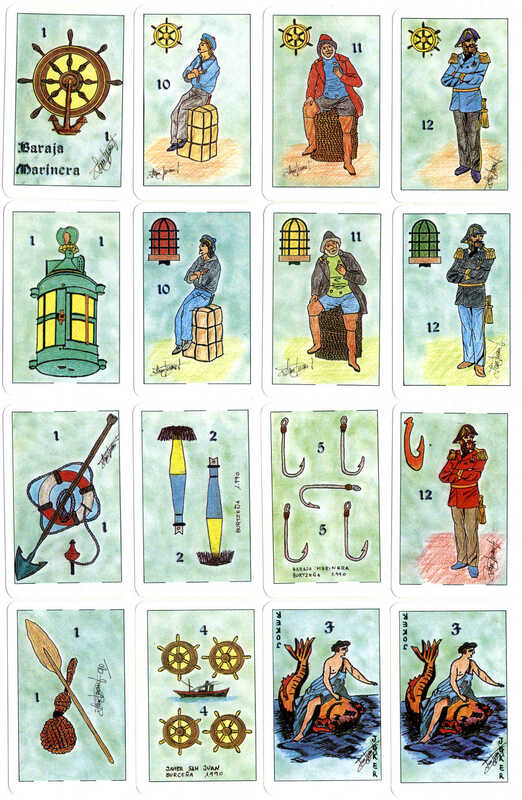 ‘Baraja Marinera’ was designed by Francisco Javier San Juan in 1990 and published by Asescoin (Madrid) as their special (limited edition) member's pack in 1995. The project was a memorial to Don Luis Mayoral Cholo who was an expert sailor and a personal friend of the artist. The suit symbols are ship's wheels, lanterns, fish hooks and sailor's knots. The same court card images are used in each suit but with different colour schemes. The artist's signature can be seen on every card. An extra card explains that the fish hook suit also includes paleolithic and neolithic hooks as well as squid lures, whilst the Ace shows a whaling harpoon. 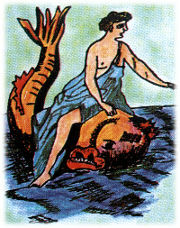 Above: ‘Baraja Marinera’ designed by Francisco Javier San Juan, published in a limited edition by Asescoin (Madrid), 1995. 40 cards + 2 Jokers + 3 extra cards in tuckbox.